In the American legal system valid witness-testimony is supposed to be invariable and unchanging, so defense attorneys highlight seeming inconsistencies in victims’ accounts to impeach their credibility. This book offers an examination of how and why victims of domestic violence might seem to be ‘changing their stories,’ in the criminal justice system, which may leave them vulnerable to attack and criticism. 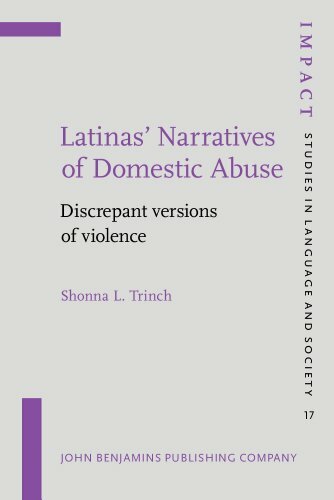 Latinas’ Narratives of Domestic Abuse: Discrepant versions of violence investigates the discourse of protective order interviews, where women apply for court injunctions to keep abusers away. In these encounters, two different versions of violence, each influenced by a range of ethnolinguistic, intertextual and cultural factors, are always produced. This ethnography of Latina women narrating violence suggests that before victims even get to trial, their testimony involves much more than merely telling the truth. This book provides a unique look at pre-trial testimony as a collaborative and dynamic social and cultural act. This volume contains such chapters as: narrating violence in institutional settings; language ideology and the function of narrative structure; language ideologies of narrative production and performance; Latina narrators interacting with institutions; and power, control, opposition and omission.